Catholic Diocese Accused Of Covering Up "Rare Cancer" GoFundMe Scam By Priest Who Preyed On Parishioners - Joe.My.God. A Starkville priest is at the center of a criminal investigation involving a string of fraudulent charity efforts that federal agents believe was covered up by church leaders in Jackson. 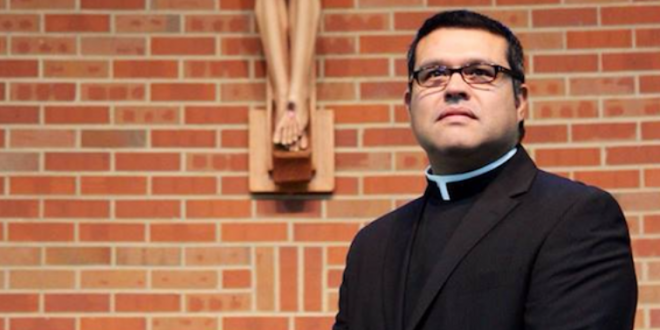 According to a 37-page affidavit filed Friday by Department of Homeland Security Special Agent William G. Childers in U.S. District Court in Jackson, an ongoing investigation into Father Lenin Vargas-Gutierrez, a pastor at St. Joseph Catholic Church in Starkville, shows the priest is accused of lying about being diagnosed with cancer and soliciting money from parishioners for treatment and other pet projects. Vargas, a native of Mexico, has been in Starkville for roughly five years, according to court records and agents claim, through the use of confidential informants, that Vargas, who was actually diagnosed with HIV in 2014, used the fake cancer claims to solicit tens of thousands of dollars from church parishioners over the last several years. After receiving complaints, Bishop Joseph Kopacz ordered an internal accounting audit of the Starkville Parish’s finances. After Bishop Kopacz’ staff conducted the audit, the Diocese placed fiscal constraints on Father Vargas’ spending and found that he was violating diocesan policy concerning soliciting charitable donations and demanded that he stop these activities and conduct no further charitable fundraising without first informing the diocese of these planned activities. The continued spiritual and financial well being of St. Joseph Parish and Corpus Christi Mission is of the utmost importance, and we will continue to aid you both in sound fiscal management of all of your resources. Let us pray with trust that the Lord Jesus will shepherd us through this difficult time of upheaval and uncertainty. Father Vargas was also allegedly stealing from the weekly collections and objected to a plan to place a camera in the counting room. He also reportedly had daily Skype sessions with the owner of a Mexican bar called….wait for it….Heaven & Hell.